I’ve been a movie fan for a long time, and as such, I reached this point about a year ago where I decided that even though action movies can be done well, we’ve seen pretty much all there is to see in the action genre. I was very wrong. It’s been 30 years since George Miller’s last Mad Max movie, but now, he’s decided to continue the series with Mad Max: Fury Road. The movie sees Max Rockatansky (Tom Hardy) return to post-apocalyptic Australia, joined this time by Imperator Furiosa (Charlize Theron). The two must work together to outrun the tyrant, Immortan Joe (Hugh Keays-Byrne), on the barren roads of the Wasteland. Mad Max: Fury Road is one beautifully psychotic car chase that hooks you with its action, pulls you along by its solid characters, and doesn’t let you go until the credits roll. I know that’s a little wordy, but it barely even scratch the surface of what this movie is. Long story short: Mad Max: Fury Road is one of the best action movies I’ve ever seen. Action flicks released during the summer movie season can get pretty bland and shoot-y at times. Thankfully, Mad Max: Fury Road is the kind of summer movie we don’t see anymore: a really freaking weird one. Seriously, it is one of the strangest movies you’re going to see this summer, and considering this movie season brings us stuff like Avengers: Age of Ultron and Jurassic World, that’s really saying something. The best part about this weird movie, however, is that it makes you believe it’s not weird. Fury Road drops you into this bizarre world and offers no explanation as to why it’s so strange. Why is there a onesie-wearing blind dude playing a flame-throwing electric guitar? Why not? You’re not treated as an idiot. You’re thrown into this crazy world and forced to accept things as they come. Once you get past the weird nature of this world, you really accept this crazy setting for what it is: detailed, visually stunning, and unlike anything you’ve ever seen before. Speaking of “unlike anything you’ve ever seen before,” let’s talk about the action this movie revels in. Now, when I said at the beginning of this review that the whole movie was one big car chase, I really meant it. The action seen in Fury Road is over-the-top and innovative, providing some wildly entertaining and visually stunning thrills. I can only talk about it so much, because Fury Road’s choreography is really something that you need to see to believe. The whole concept of the movie being a giant game of cat and mouse also allows for some great scenes with no dialogue or action, but plenty of suspense. The conflict here reminded me a lot of the movie, Whiplash: simple, but solid. This story structure allows for a great buildup of tension, even when things aren’t going “boom.” Of course, that’s where those similarities end, because J.K. Simmons never threw an exploding javelin at Miles Teller when his character was on the drum kit. With all this emphasis on fights and explosions, you might start to think that everything else about Mad Max: Fury Road is subpar, and that’s where you’d be wrong. I can’t say this film’s main focus is action, but…actually, yes. That is exactly what I’m going to say. This film’s main focus is action, but I’m not just referring to car chases. Fury Road finds meaning through its interesting characters, who aren’t really given much to say. Rather, their actions are meant to define their motivations. Their dialogue isn’t irrelevant, but it certainly takes the back burner. While Tom Hardy delivers a solid performance as Max Rockatansky, he’s really just an observer, providing minimal input into the story unfolding before him. The true hero and protagonist of the film is Charlize Theron’s Imperator Furiosa. Her motivations take center stage, and the movie is 20x more engaging for it. If Fury Road’s high-flying action makes it a great movie, it’s characters like Furiosa that make it a masterpiece. Charlize Theron as Imperator Furiosa. No, you’re not seeing things. There was nothing I didn’t like about this film. 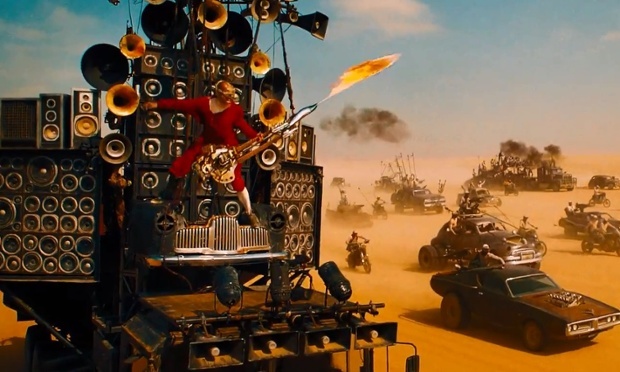 There’s so much more I want to say about Fury Road. It’s this great, big, gargantuan thing that is so much more than it looks. We’re only a month into summer movie season, but I feel like I say with confidence that if you only see one movie this summer, let it be Mad Max: Fury Road.